Loss is a shapeshifter. It can manifest in a mover's truck, appear as a stream of tears on your mother's face, and can leave you feeling hollow and empty like a hole has been punctured in your skin and your insides have leaked out. How to Say Goodbye in Robot is about all of these forms of loss and the spaces they create - within a person and between people. Natalie Standiford skillfully reveals this rich emotional landscape as she takes the reader through the complicated, painful and gorgeous lives of her characters as they confront their losses and navigate the gaps left in their wake. Bea Szabo has recently moved once again because of her father's work, this time to Baltimore. "I learned not to get too attached to anything. I stopped thinking of the houses we lived in as my house, or the street we lived on as my street. Or my friends as my friends." She has become so good at not caring that in the first chapter her mother calls her a robot and Bea wonders, "Am I? I knocked on my belly. It didn't clang the way a robot's belly should. Far from it. But that assumed a robot was always made of tin, or steel, or some other clangy metal." Armed with her mechanical heart and skin of steel, Bea begins her senior year at yet another new school. On the first day she meets Jonah Tate, a pale and reclusive boy who has been nicknamed Ghost Boy. Drawn to his loner personality, she attempts to befriend him. Ah, the beginnings of a typical love story. Loner girl meets loner boy. Loner girl gets dismissed by loner boy. But finally loner girl wins loner boys heart? Nope. Natalie Standiford never even lets How to Say Goodbye in Robot begin to get typical. Yes, Bea is drawn to Jonah. And yes, he does seemingly dismiss her at first. But he also offers her a strange yet insightful gift: he steers her toward his favorite nighttime activity, a late-night AM radio program, The Night Light Show. Bea is immediately hooked on this talk show about traveling to the future, ghost visitations, but mostly just lonely people trying to connect - and so is the reader. Just as The Night Light Show and its regular callers become touchstones for Bea, they become touchstones for the reader as well. Each caller is so sharply drawn, with his or her own spare and compelling details, that the reader is able to connect with all of them as the story progresses. As a result, the story has tremendous depth and multiple points of resonance, which allow the reader full access into a realistic, complicated, and specific world. Jonah and Bea become more than friends, but they're not romantically involved. Standiford creates a relationship that is unique, but also extraordinarily relatable. And when Bea learns about Jonah's family secret, she can't help but let her own heart beat instead of clang, and her skin become soft instead of synthetic. And this warming of her body for his mission begins to permeate her entire life. She begins the painful process of choosing humanness - with all of its transience and unpredictability - over robotness. Loss leaves a wide and frightening space, but Bea finally decides that the answer is not to harden it or make it disappear, but to fill it, instead, with something new. And sometimes, just sometimes, the new thing brings joy, hope and love. This review was originally published in November 2009, and has been updated for the December 2010 paperback release. Click here to go to this issue. Natalie Standiford is a rock star! Not only does she write books for children and young adults, but she is also in two bands. One is a punk rock band called Ruffian, and the other - check this out! - is an all YA-author band called Tiger Beat. Natalie's band-mates include Libba Bray, Daniel Ehrenhaft, and Barnabas Miller. 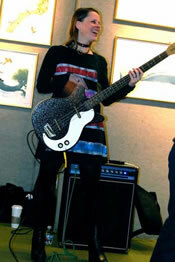 Natalie plays the bass guitar. Tiger Beat had their debut in March 2009 in the New York City independent bookstore Books of Wonder. Can you imagine rocking out to familiar cover tunes and then buying books and having the authors-musicians sign them - all at once!